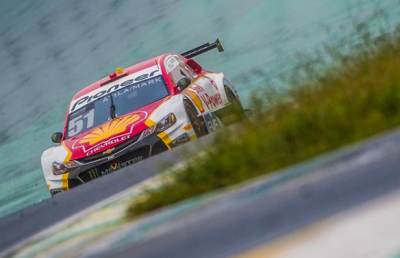 Mark Winterbottom narrowly missed out on a top 10 finish following an impressive recovery drive in the opening round of the Brazilian Stock Car Series at Interlagos. The Tickford Racing Supercars driver, alongside regular Atila Abreu, were forced to start the race from the rear of the grid after a fuel pump issue prevented the Shell backed #51 Chevrolet from taking part in qualifying. Heavy rain also delayed the start of the two driver enduro by half an hour as the field prepared to tackle treacherous conditions. Winterbottom and Abreu made steady progress on a wet but drying track eventually climbing to 12th position from 33rd on the grid. The pair were promoted to 11th following a post race penalty. “We went from Position 33 to Position 12 in a shortened race due to weather,” read a post from Winterbottom on Instagram prior to the penalty. “Happy with the result but disappointed we didn’t make qualifying as I feel we could have won from a better starting position. The race was won by Daniel Serra and Joao Paulo de Oliveira in the Eurofarma backed Chevrolet. Ex-Formula 1 driver Rubens Barrichello and Felipe Albuquerque finished second, while Cesar Ramos and South Africa’s Kelvin van der Linde completed the podium. However, a 20 second penalty for stopping under Safety Car for the third place finishers saw Ricardo Mauricio and former Sauber F1 driver Felipe Nasr elevated to the final podium spot. Gabriel Cassagrande and co-driver Chris van der Drift from New Zealand were classified in 32nd position.